6.5 inch Red Confetti Latex Balloon with 2.2G 10PCs in one package. Great for wedding parties, and many other parties and festival occasions. 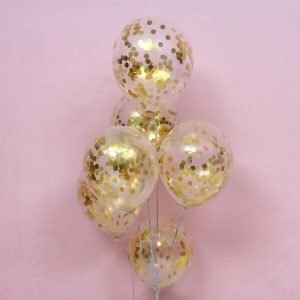 Uses: Confetti balloons are just so cute and adorable for a baby or bridal shower. Amazing party decorations for the tables at a wedding or graduation. You can use them as a part of your gifts to your bridesmaids and they will love that. Excitement: It’s intersting to prepare the mylar balloons for your kids or other friends as an birthday party toy. They definitely add style to a party. People just love balloons, they stand for fun and entertainment. Durable: Our quality build balloons for all occasions are made of latex and support helium. Our customers have told us that they were still going strong a week after their party. What excitement when you pop the balloons and all the confetti comes falling down, beautiful for New Year’s Eve. Confetti balloons really complete all your other decorations. Easy to use: Can be filled with air, blowing them up is very easy with a balloon pump, then tied with ribbons or strings.